Want to make sure that your wallet gets returned, in case you lose it by any chance? Well, then obtain a photograph of the cutest baby you can find, and ensure that it is prominently displayed in your wallet, according to a study. Psychologists have found that if people find a wallet on the street, they are more likely to post it back if it has a picture of a baby. They say that the answer behind such a tendency depends rather more on evolution than morality. For their study, the psychologists had planted hundreds of wallets on the streets of Edinburgh by last year. But surprisingly, nearly half of the 240 wallets were posted back. Psychologist Richard Wiseman and his team inserted one of four photographs behind a clear plastic window inside, showing either a smiling baby, a cute puppy, a happy family or a contented elderly couple. Some wallets had no image, and some had charity papers inside. 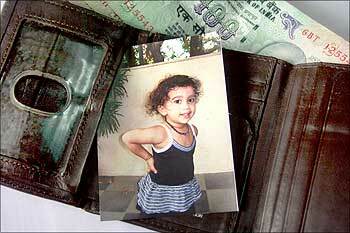 It was found that people were far more likely to send the wallet back is they faced with the photograph of the baby. In fact, only one in ten were hard-hearted enough not to do so. However, just one in seven of wallets without any picture were sent back. Wiseman said that the result reflect a compassionate instinct towards vulnerable infants that people have evolved to ensure the survival of future generations. "The baby kicked off a caring feeling in people, which is not surprising from an evolutionary perspective," Times Online quoted him as saying. Overall, 42 per cent of the wallets were posted back - more than the team had anticipated. "We were amazed by the high percentage of wallets that came back," said Wiseman. He added: "If you want to increase the chances of your wallet being returned if lost, obtain a photograph of the cutest baby you can find, and ensure that it is prominently displayed."